Hand held coating thickness gages are common inspection tools used by applicators and inspectors. With a little care and maintenance, mechanical and electronic instruments can be relied upon to give many years of accurate and dependable service. 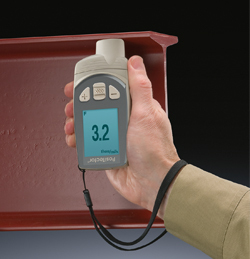 An electronic, hand-held coating thickness gage. Prior to first use, and occasionally thereafter, it is always a good idea to review the instruction manual to familiarize yourself with the instrument’s features and capabilities. Record the make, model, serial number and date of purchase inside the manual and highlight maintenance and calibration tips. Now is the best time to establish a calibration interval. Calibration is the act of measuring known Calibration Standards and verifying the results are within tolerance. How often the gage should have its calibration checked depends upon many factors including frequency of use, the application in question, as well as the level of care taken during use, handling and storage. If you are someone that uses a gage frequently, measures on abrasive surfaces or uses the gage roughly, your gage may require a relatively shorter calibration interval. Make it longer if your gage spends most of its time on the shelf. If uncertain, start with a one year calibration interval from either the date of calibration, date of purchase, or date of receipt. What do you do at these intervals? That depends upon the quality system you have in place. Some owners simply measure a sample part when their gage is new and record the result. This sample is then saved and used to regularly check operation and accuracy of the gage. The best and most universally accepted method, however, is to measure Calibration Standards using a documented procedure. 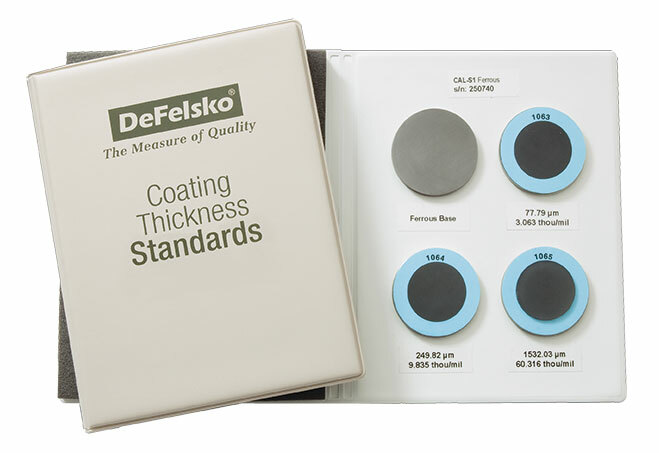 Coating Thickness Standards are available as either certified coated metal plates or plastic shims. Plates are usually more accurate. The process of measuring them is described in a document called a Calibration Procedure which some manufacturers give upon request at no charge. Alternatively, return the instrument to the manufacturer or to a qualified lab to have this work performed for a nominal fee. Now that you have taken care of the paperwork, take practice measurements with the test panels or shims that came with your coating thickness gage. You can even use office furniture or other handy coated parts to ensure the gage works properly and that you are using it correctly. Gages come in all different shapes and sizes. So get to know the proper way to hold and operate your particular model. 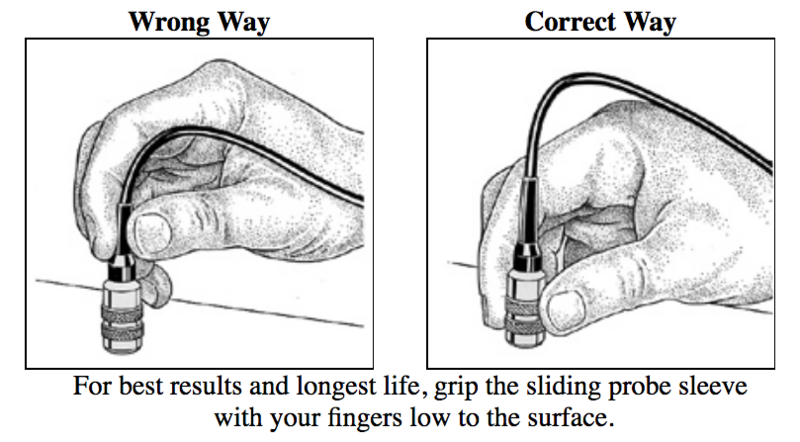 The majority of hand held instruments take one measurement at a time. Lift the probe away from the surface between measurements. Dragging the probe reduces probe life. Once the gage has been put into service, it should always be inspected prior to use. Look for obvious damage, particularly to the probe or probe cable. Constant-pressure probes should move up and down freely. While the gage body can work even when scratched, nicked, or covered with paint overspray, the probe cannot. So examine the probe carefully. Pay particular attention to the surface that comes into contact with the coating. Damaged, scratched or worn probes should be tested for accuracy and replaced when necessary. Metal filings, dust and paint should be carefully removed with a cloth. Hot and rough surfaces are most harmful to coating thickness probes. For longest life, avoid prolonged exposure to hot surfaces and allow the probe to cool between measurements. Respect rough surfaces by lowering the probe carefully and by never dragging it sideways. Plastic shims of known thickness can be placed onto these surfaces to afford the probe some protection. The gage will measure the total shim + coating thickness, but the thickness of the shim can be subtracted from the measured thickness. Be mindful of the additional measurement tolerance resulting from use of the shim. Indications that a gage may need service include lower than expected readings (often a sign of probe wear), higher than expected readings (foreign material may be stuck on the probe) and erratic measurements (a possible sign of a component failure). It is a good idea to take one final look at the probe before putting the instrument away. Fresh paint or other adhered materials can be removed and problems can be dealt with immediately, thus preventing a nasty surprise the next time you go to use it. It is usually OK to leave batteries installed and probes attached during short periods of non-use. Return the gage to its pouch or to the original packaging. Cover the probe. Store in a dry location away from magnetic fields and extremes of temperature. When retrieving it for the next job, a quick operation check on a known thickness is prudent. This precludes the need for periodic scheduled maintenance. And don’t forget to bring along the manual and extra batteries. Whether magnetic, eddy-current or ultrasonic, a coating thickness gage requires only a modest amount of regular attention to ensure years of accurate and reliable service.